The 2 ft. White LED High Bay Light from Lithonia Lighting is ideal for illuminating large commercial areas such as warehouses, retail spaces, garages, gyms, manufacturing facilities and other work areas. This is the perfect energy-efficient and maintenance-free replacement or upgrade choice for existing HID metal halide and fluorescent high bay light fixtures. Offering 31% greater efficiency than traditional T5HO fluorescent high bays, this LED fixture helps save on energy costs and eliminates the hassle of changing bulbs. The Commercial Electric 3 ft 64 watt equivalent Integrated LED Shop Light provides energy-efficient task lighting or general purpose lighting for utility applications such as workshops, garages, utility rooms and basements. This fixture is mounted using included chain. The light-weight nature of this LED Shop Light allows for easy installation. Using Commercial Electric LED Light fixtures will save you significant dollars with regard to your operation costs. Feit Electric's 2 ft. Dual LED Full Spectrum Grow Light only uses 19-Watt and comes fully assembled with an ultra-light weight design that can be used in hanging or flush mount installation. This no-humming LED emits precise wavelengths and colour for superior photosynthetic response in the 450 nm blue spectrum preferred for vegetative growth. There are no lamps to dispose of or replace with this 2 ft. Dual Lamp with it's cool operation that prevents burning of leaves compared to high pressure sodium lamps. Includes two 6 in. hanging wire harnesses as well as a 5 ft. plug-in chord and easy on/off light switch. Durable smooth edge housing and light weight design facilitates the installation process. Up to 8 of these fixtures can be linked together with its 5 ft. cord enabling easy and flexible runs. Globe Electric's 6-pack 3-LED Under Cabinet Slim Puck Light is the perfect solution to all your lighting needs. The three surface mounted LEDs provide a bright 55 lumen light and do not use a lot of battery power. The universal remote control allows you to dim the light, turn it on and off with ease and set an auto-off timer at different intervals. If you have more of Globe Electric's Under Cabinet Lighting, you can use just one remote with everything! We try to make it as easy as possible. Place this light wherever you need it most with the included double-sided tape or simply use the provided screws for a more permanent placement. Changing the batteries is a breeze! Twist the light to release it from its placement and simply pop the top off with handy indented corners to change the batteries. A stand located at the back of the light is a brilliant way to use this piece anywhere in your home. Includes three AAA-type alkaline batteries, two screws and one piece of double sided 3M tape for each puck light. 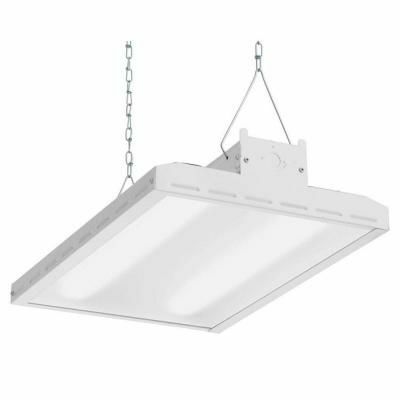 IBH 11L MV 2 ft. White LED High Bay Light The 2 ft. White LED High Bay Light from Lithonia Lighting is ideal for illuminating large commercial areas such as warehouses, retail spaces, garages, gyms, manufacturing facilities and other work areas. This is the perfect energy-efficient and maintenance-free replacement or upgrade choice for existing HID metal halide and fluorescent high bay light fixtures. Offering 31% greater efficiency than traditional T5HO fluorescent high bays, this LED fixture helps save on energy costs and eliminates the hassle of changing bulbs. IBH 11L MV 2 ft. White LED High Bay Light is rated 4.8 out of 5 by 142. Rated 5 out of 5 by John from This is billed as a high bay light but I... This is billed as a high bay light but I used two of these as replacements for low bays in an application with 12 foot ceilings and they work great. Lights a space 28' x 20 very well. How many lights would you recommend for a garage that is 32 X 40 and 14ft high.